Two weeks after Beijing shifted to a new currency regime in an effort to bring about a managed yuan devaluation, we explained why it really all comes down to the death of the petrodollar. When China began to burn through its FX reserves in a frantic attempt to put the deval genie back in the bottle, the world suddenly awoke to what it means when emerging markets begin burning through their rainy day funds. Of course the reserve burn had been unfolding for quite sometime. That is, China’s epic UST liquidation was simply the most dramatic example of a dynamic that was already at play. As Deutsche Bank noted, the “Great Accumulation” ended months ago, as the world’s emerging economies began to dip into their USD war chests to defend against commodity currency carnage and the attendant capital outflows. Saudi Arabia’s net foreign assets fell to the lowest level in more than two years in August and demand for loans among private businesses slowed, as the kingdom grappled with oil prices below $50 a barrel. 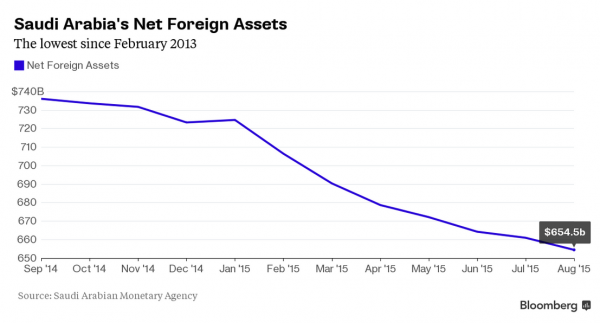 Falling for a seventh month in a row, net foreign assets held by the central bank dropped to $654.5 billion, the lowest since February 2013. That compares with $661 billion in July, the Saudi Arabian Monetary Agency said in its monthly report. Credit to private businesses grew 8.4 percent, the slowest rate since 2011. The biggest Arab economy is showing signs of strain after oil prices tumbled about 50 percent over the past 12 months, pushing authorities to search for savings and sell bonds for the first time since 2007. The government, so far, has been short on specifics on how it will reduce spending, though planners are said to be considering measures long viewed as off-limits or unnecessary, including phasing out fuel subsidies and investing in renewable energy. Importantly, any meaningful intervention on the part of Riyadh in Syria will only serve to increase the SAMA strain. For those interested in getting a read on where things are headed both in terms of global monetary policy and geopolitics, watch the Saudi FX reserve figure closely as it not only serves as a guide to how long the kingdom can hold out in the literal war against the Houthis in Yemen and the figurative war against the US shale complex, but also proxies (along with Chinese reserves of course) for the extent to which the quantitative tightening thesis is playing out in EM.